A fresh batch of changes is on its way and Shacknews is here to analyze each of them. Earlier today, Blizzard went into detail regarding what's next for Hearthstone. The meta is about to undergo a few changes with Update 12.3, which will change three specific cards en route to the game's next expansion, which is expected to be announced at BlizzCon 2018. Here's a full refresher on those changes, which adjust two cards from the current Standard and one that's been plaguing Wild. Shacknews is here to break down these changes, one-by-one, and analyze the impact that they'll have on the meta going forward. Blizzard explanation: Giggling Inventor is one of the most powerful and popular cards we've ever created. There's virtually no downside to including it in a deck, and because it's neutral, it’s played in almost every deck. We think it's important to take risks when making powerful cards, especially when it comes to neutral taunts, given the role they can play in encouraging minion interactions and making games more interesting. However, Giggling Inventor has stepped beyond its intended role, and we don't feel that it should be as effective as it currently is. We initially tested this card at (6) mana in both the current Standard format as well as with cards that will be released in the future. Ultimately, we felt that its power level was still higher than is appropriate for a Neutral card with no build-around requirements. At (7) mana, we expect Giggling Inventor will find its way into fewer decks in general—and be much less effective in Quest Rogue — while remaining situationally playable within specific deck archetypes, such as Evolve Shaman. I expect this card to be completely gone from a lot of decks. It's still a fair addition in Quest Rogue decks, because it can come out in later turns and still provide two 4/4 Annoy-o-Trons. But it's going to prove too expensive for Druid, Warrior, and Warlock decks, especially with better stall tactics out there. Giggling Inventor has had its day, but it looks like that day is ending. 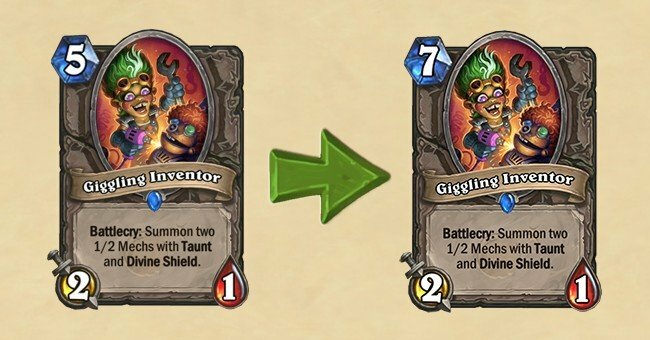 What's particularly interesting about Blizzard's statement is that they made sure to test Giggling Inventor at 6 mana and still found it too powerful for future cards. Whatever the team tested it with, it's clearly proven too powerful for even decks, which will be something to keep in mind going forward. What card with an even cost that's coming in the next expansion could be so strong that it proved to work too well with a 6-Cost Giggling Inventor? Blizzard has also cited the 7-cost Giggling Inventor as something to pack into Evolve Shaman decks, but another thing to keep in mind is that it's now going to further poison the well for random 7-cost cards. Random Evolve effects now have just as much risk of popping out a useless 2/1 as it does pulling out a useless 1/1 drop. This will also prove true for random minion drops from minions like Spiteful Summoner and Astromancer. Keep this in mind for the future. Blizzard explanation: Over time, we've been moving away from powerful, early-game 1-drops like Mana Wyrm. It can often feel like the outcome of a game is decided by whether Mana Wyrm was played on turn one, and if it could be removed quickly by an opponent. Mana Wyrm has also steered us away from making powerful low-cost Mage spells. We'd like Mana Wyrm to remain an option for decks it synergizes with, while preventing it from being a huge turn one threat. At (2) mana, it will be easier to deal with Mana Wyrm the turn it's played, and it will be harder to buff it with cheap spells early in the match. We still expect it to remain an option in decks that have a heavy focus on cheap spells, but it should be a less appealing option in decks that aren’t built with that focus in mind. Shacknews analysis: Mana Wyrm has been 1-mana for as long as I can remember, but truth be told, it's reached a point where I'd hit the "Concede" button if an opposing Mage player drops it on Turn 1. It can make that much of a difference in Aggro Mage decks. With Aggro Mage decks getting more and more out of control with the additions of cards like Cosmic Anomaly and cheap spells like Primordial Glyph, Turn 1 Mana Wyrm can swing the game all by itself. Aggro Mage takes a big hit with this change and with Big Spell Mage going by the wayside, Mage as a whole will probably suffer until the next expansion. But with Blizzard hinting at the heavy impact of low-cost Mage spells, Mage players may look to rebound by playing a combination of Sorcerer's Apprentice and Stargazer Luna and get some practice in before regrouping for whatever Blizzard trots out next. 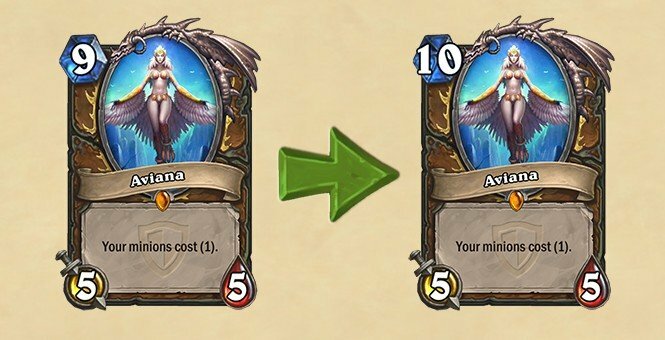 Blizzard explanation: Changing Aviana to (10) mana means it will no longer be possible to play Aviana and Kun the Forgotten King on the same turn without some additional help from cards like Innervate or The Coin. It also means Juicy Psychmelon will no longer draw both Aviana and Kun. This should make the combos Aviana and Kun produce less consistent, while still allowing decks that use the combos to exist for the players that enjoy playing them. Shacknews analysis: Are those pesky one-turn kill combos with Aviana and Kun the Forgotten King finally dead? Not exactly. First, some context. 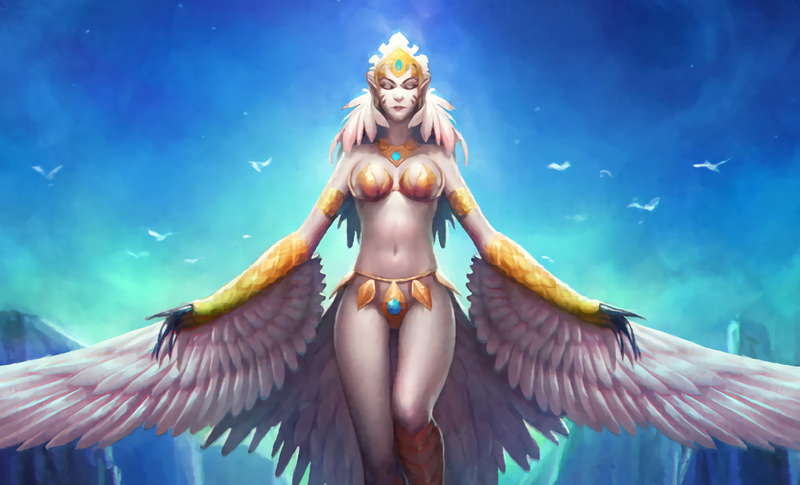 Aviana's nerf has been necessitated for some time, since Aviana could be played for 9 mana, following by Kun the Forgotten King, which would refresh all ten of the player's mana crystals. Aviana's effect would allow players to drop all minions for (1), meaning they could drop in any combination of Malygos, Facelss Manipulator, Flobbidinous Floop, or Ixlid, Fungal Lord to create enough magic power to obliterate in opponent in a single turn. After a few expansions of this, one could see why something needed to be done. But Aviana's increased cost doesn't so much kill the combo as it does force the Druid player to get a little more creative. Blizzard has already cited Innvervate as a potential solution, but think a little more outside the box. Burgly Bully is a quick way to provide Coins that can grant additional mana. Emperor Thaurissan can discount Aviana back to its 9 mana cost. Or how about Dreampetal Florist, which can bring Aviana down to just (3)? Aviana/Kun combos aren't so much dead. They're just mildly inconvenienced. Expect them to roll on strong, but in a slightly different form. The Emperor Thaurissan suggestion, in particular, might be one that players take to heart, since it'll also discount those Swipe and Living Roots spells that will simply wreck the opponent once they're amplified by multiple Malygoses. What are your thoughts on these changes? Join the conversation and let us know how this upcoming patch will affect your decks moving forward. Look for Hearthstone's Update 12.3 to arrive this Thursday, October 18. So less quest rogue and definitely less people playing tempo mage to counter quest rogue. I would have liked to see one of the druid cards nerfed, but this is enough for a new meta, which is what the community wanted.